We’re just back from a brilliant weekend camping at Comrie Croft near Crieff in Perthshire. 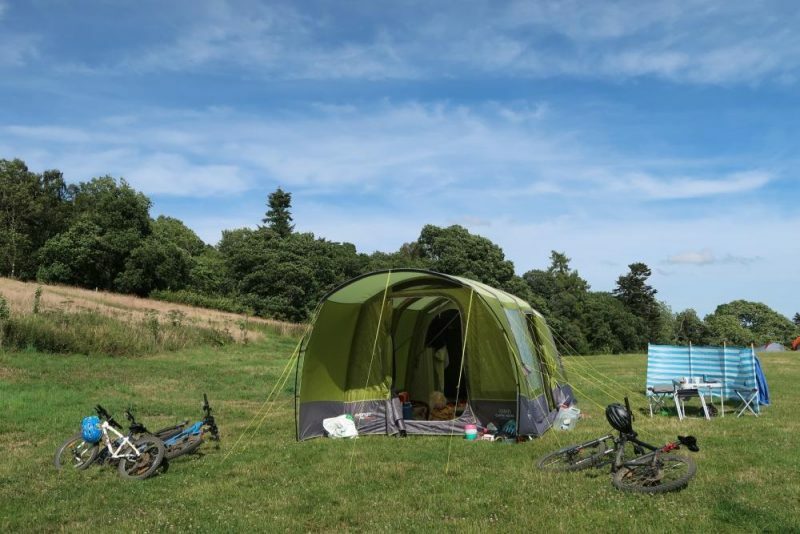 Comrie Croft is a great eco-campsite, with several camping areas, woodlands, pond, tea room, shop, bike shop and workshop, bike tracks and bike skills park. 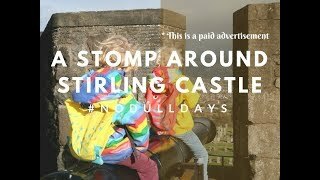 The perfect place to take two bike mad children! Every day was spent on the bike track and skills park, I think we all felt a lot fitter after our 3 days away. If you don’t have space to bring your bikes then you can hire bikes at the campsite too. Don’t forget a first aid kit though, especially if you have accident prone kids like ours! 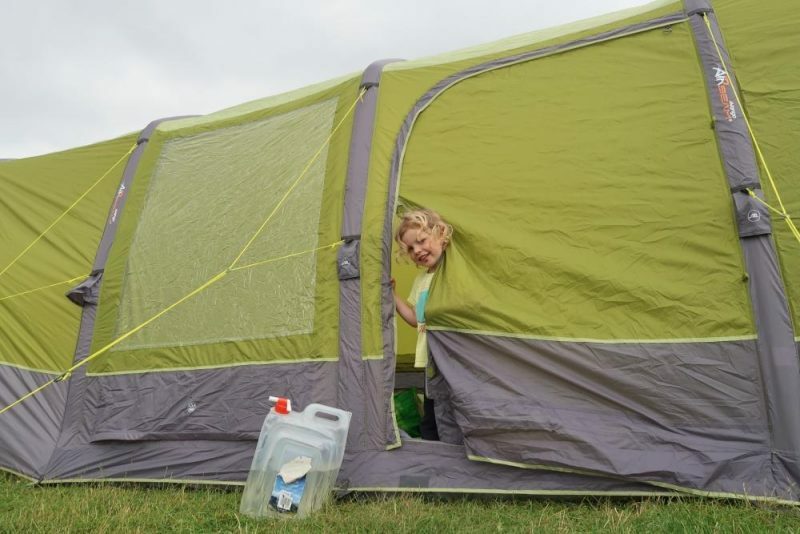 We were sent the Vango AirBeam Capri 400XL tent to review at the weekend. 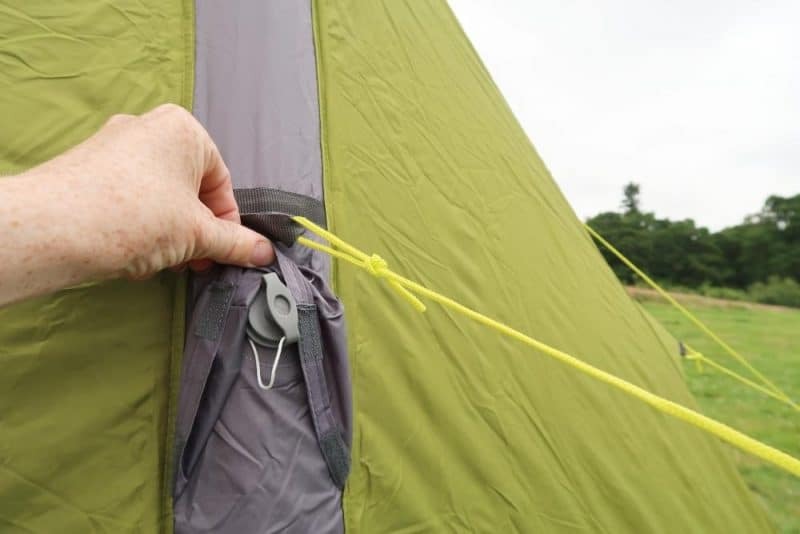 I specifically chose an AirBeam because our last tent broke a pole and was fiddly to put up. My hope was that this tent would be easy to put up with just one person, meaning the other parent could entertain the kids. Plus with no poles it might be a bit more flexible in the Scottish winds! As it was our first time putting the tent up we worked together, but it was fairly straightforward and could easily be done by one adult. It really would be easy for a single parent to put it up, simply peg it down first, inflate the first ‘pole’ and slot in the only actual pole for the porch area. Once that’s done and a couple of guy ropes pegged down at the front you can blow up the remaining poles and peg all the ropes down. Now we know what we’re doing I think we could get the tent up with one person in half an hour. Definitely a lot quicker and less faff than pole tents. The poles or AirBeams are a lot thicker than we thought and are very sturdy considering it’s essentially air inside a fabric bag! I placed a normal sized water bottle next to the AirBeam to show the size of it. 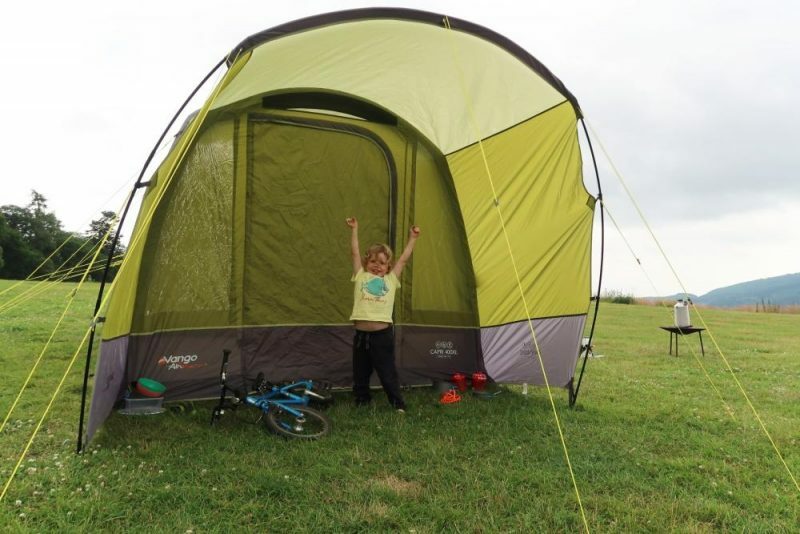 The tent arrives with everything you need, including the pump, valves, pegs etc. The pump is easy to use and even the children are able to use it under supervision. I didn’t think it would be much bigger than our last tent, but it definitely is and that extra room is going to be great for rainy days. Luckily for us we didn’t have that problem last weekend, instead we were using the tent to hide in the shade from the sun! That’s why you won’t see any of the fabric rolled back from the windows, we were trying to keep the heat out of the tent’s inner. All the windows have fabric coverings on the inside that you can roll down to let light in and nose at your neighbouring tents. Another reason that I chose this particular tent was for the porch area. Our old tent didn’t have one and the door was slightly angled upward, which looks nice enough. 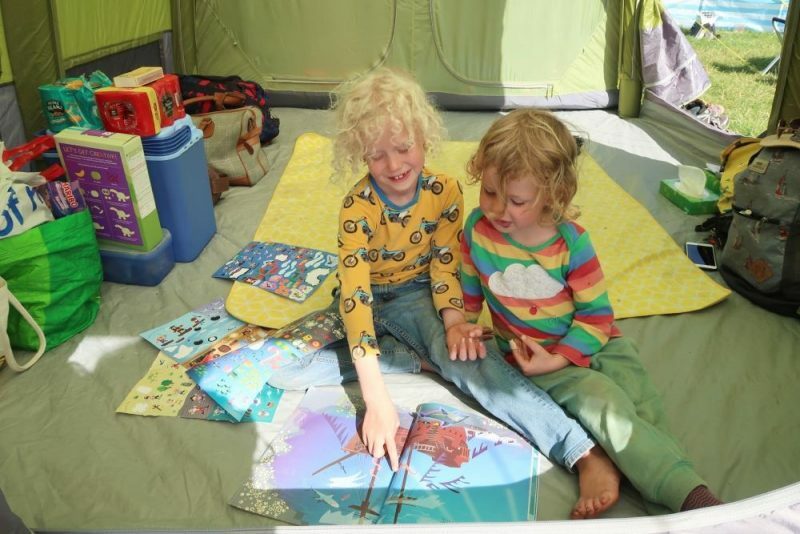 But when it rained we would let water inside the tent as we opened and shut the door, plus taking wet boots off was a nightmare and they would get the tent all messy and wet by the doorway. Now we can actually stand under the porch and be dry, not getting rain inside the tent and boots can be left outside! Hooray! Ok, it might seem trivial to others, but it’s a big deal to campers! 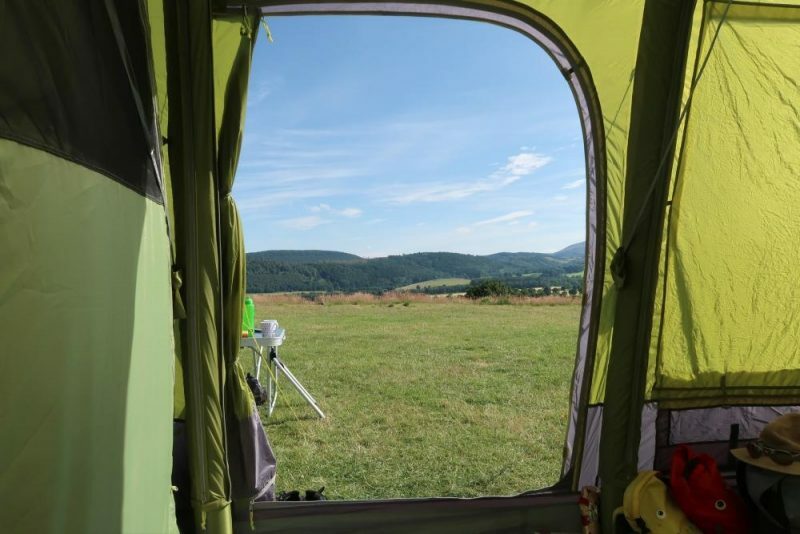 The tent has two doors, one at the front and one at the side, both can be fully opened and rolled back to let in fresh air and access inside. The front door has a fly net, so you can leave the door open with the net shut to keep out the pesky flies. The side door doesn’t have a fly sheet, so it’s best not leave it open when there are flies around, or if you do make sure the bedroom zips are closed. 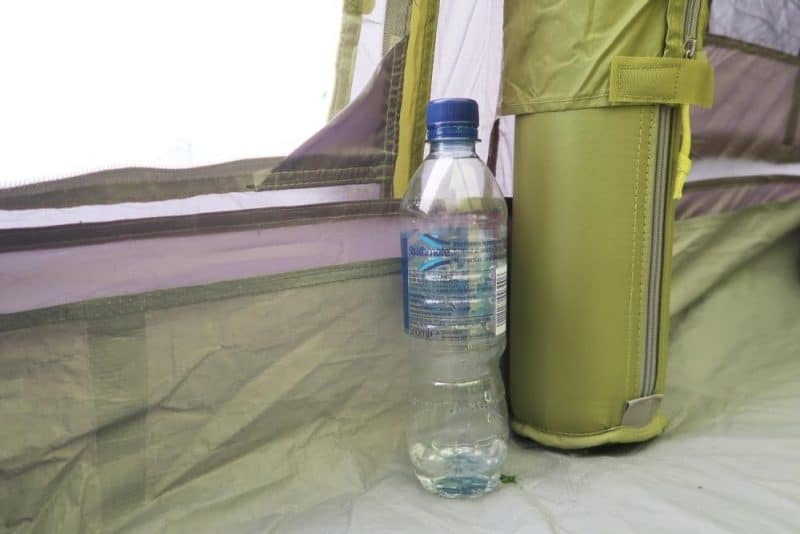 The sleeping compartment is accessed through two doorways inside the tent. A dividing curtain can be put up to separate the space into two, but we prefer to sleep altogether. We can easily fit the four of us sleeping together in the tent. Each side of the sleeping compartment is lined with pockets, perfect for keeping sleeping bags bags or valuables whilst you sleep. When you finally have to pack up and leave the campsite the tent is easy to take down. The instructions weren’t perfectly clear, but we soon worked out that you need to press and turn the button on each AirBeam to keep the valve open and release all the air. 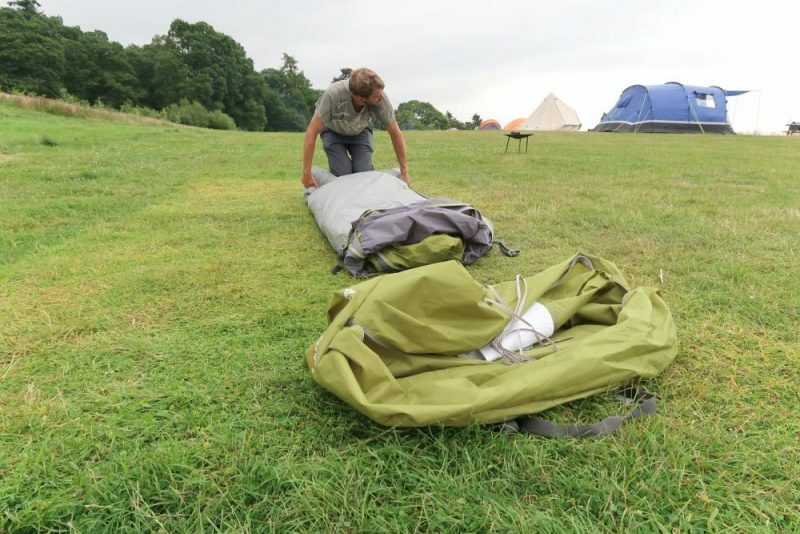 The holdall bag has a little extra room in it, so even if you don’t manage to get the tent as small as it originally was packed, there should be plenty of room to fit it and the pump etc. back in. 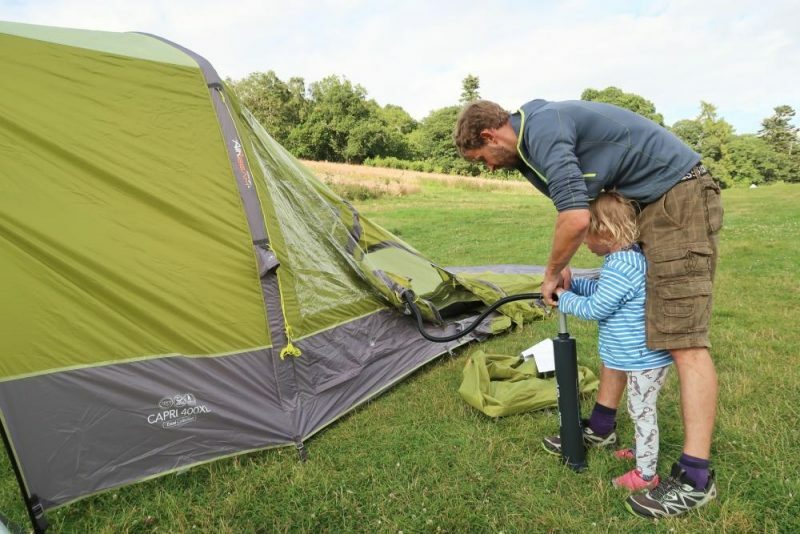 The Vango Capri 400xl Air tent is great for family camping, a good size, easy to put up and take down and the porch is an excellent idea for wet countries like ours. It is bulky, but that is to be expected from the size, so you’re never going to manage walking too far with the tent. 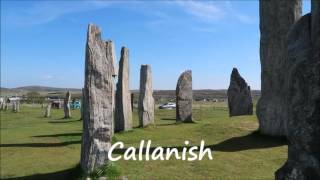 So it’s best to choose places where you can take your car to the camping field to park or unload. 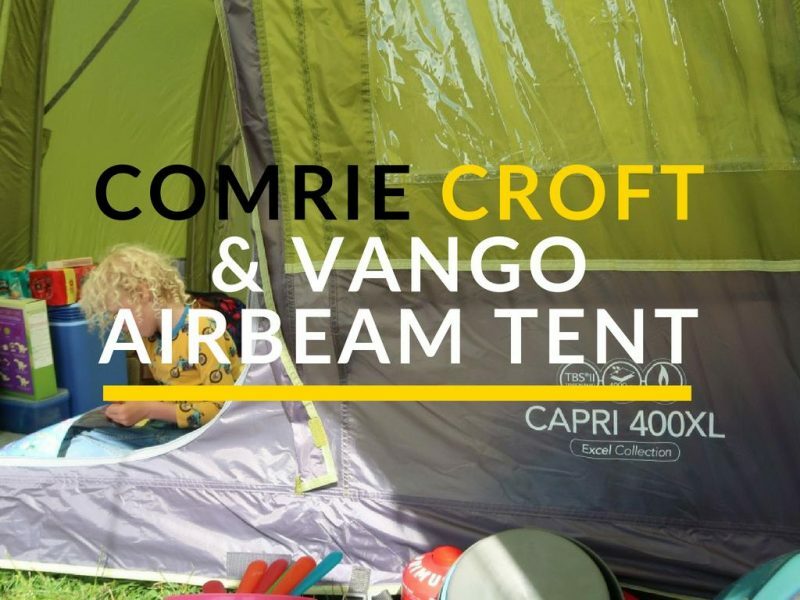 You can get a good look at the other tents, both AirBeam and poles on the Vango website here. 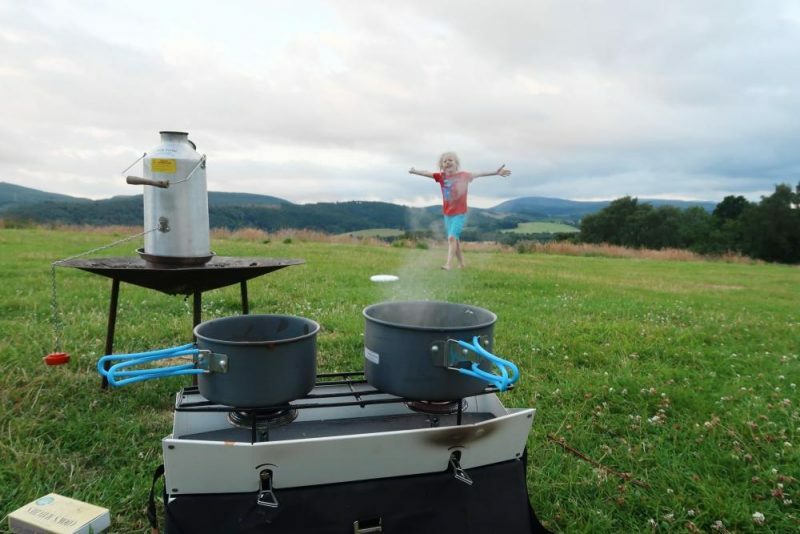 Comrie Croft isn’t too far from where we live, but it’s a great campsite, particularly for families. 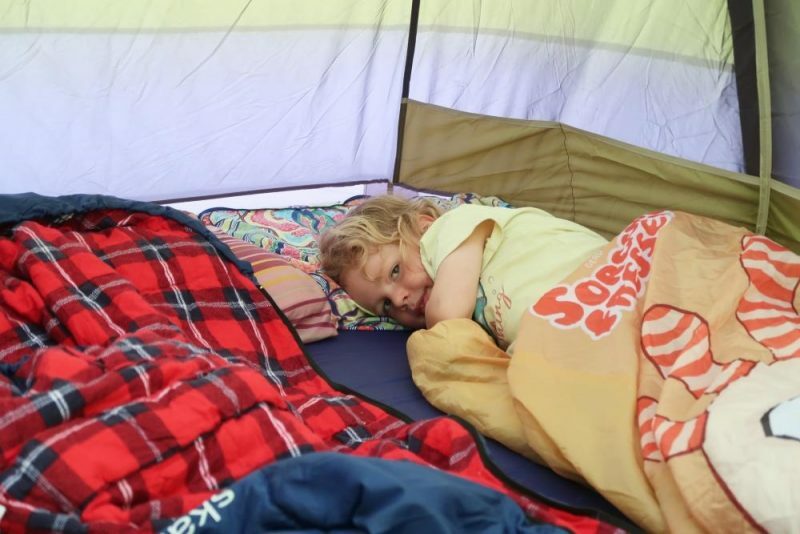 During the holidays it’s best to book as the campsite can get pretty busy! We were in the High Meadow field, where it’s a few minute walk down to the main reception area where the tea room, shop, showers, fridge etc. are. There are toilets and a dish washing area at the High Meadows, the building also has two USB ports which can be used to charge any devices you have. Even though the campsite was busy, we still found space to let the kids run around and play frisbee or explore the woodlands and pond. We did spend a lot of time on our bikes, on both the bike track and the skills park. 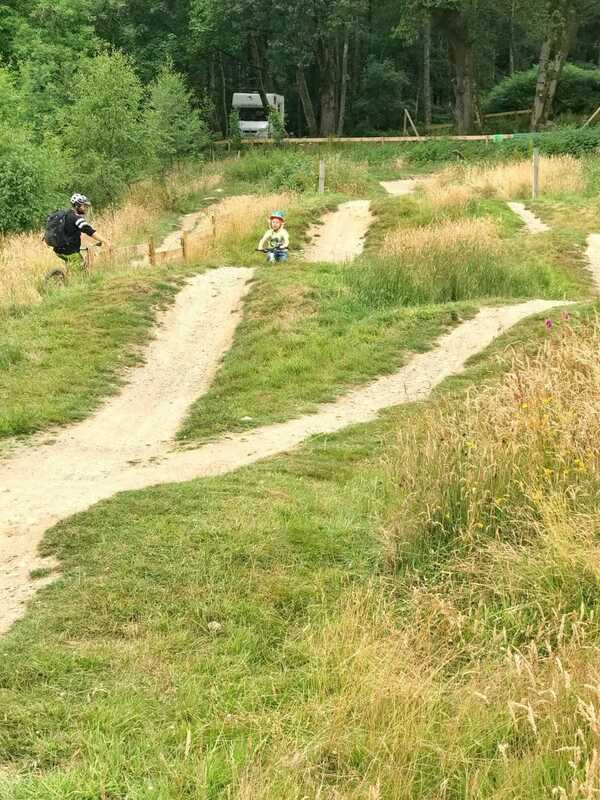 The bike tracks are for more experienced riders, but our 6 year old was perfectly capable of riding along the blue run with his dad. The bike skills park is good for all ages and when quieter little ones can easily go on all the areas without getting in anyone’s way. It is important to teach your children which way to go up (and down) on the skills park, as the no entry signs are there for a reason! We had a few issues with both children and adults trying to go up the downhill sections (or stopping on the track!) when we were zooming down, almost causing crashes. So definitely make a note of which tracks are for going down and teach kids where is safe to go up (perimeter tracks) and to only stop on the grassy areas. We stopped at the tearoom a couple of times for a slice of cake after a couple of hours of cycling. The cake is delicious and HUGE! 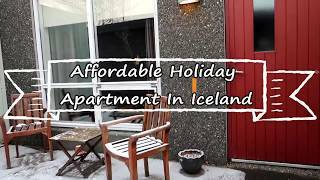 I wished we had tried some of the other food there as they had delicious looking savoury food too, but as our eldest was on the antibiotics that need to be taken on an empty stomach 4 times a day, meals were at strict times. Our eldest’s medicine had to be kept in the fridge, so I bought a small lockable case that I could put in the fridge without worrying about anyone using his medicine. The lady at reception offered to keep it in their inside fridge, but as we would need it frequently we opted for the general camp one. There is also a freezer, which was mainly filled with ice blocks. All food needs to be labelled with your name and leaving date, then if anything is left accidentally they can throw it out once you’ve left. The shop has all the essentials, including fresh produce from the gardens beside the croft, organic items, chocolate, ice cream and camping equipment. There is also a bike equipment shop next door, where you can even buy a bike! We loved our visit to Comrie Croft and will definitely be back again soon, to use the bike track as well as camp! 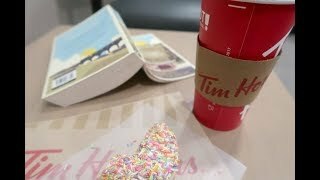 * We were sent the tent for the purpose of this review post, however all opinions are my own.